Zambian Breweries has invested more than US$400 million in Zambia in the last ten years, boosting the economy, creating jobs and supporting local businesses as a result. 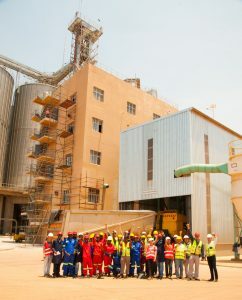 “By investing, we are helping the economy grow, and this means more jobs, business for retail traders and a knock-on effect for the wider community,” said country director Jose Moran, who stressed how the investment was a demonstration of the brewer’s long-term commitment to helping boost the national economy. In addition to the investments, the company has declared a K0.202 per share dividend to shareholders. The dividend payout was confirmed at the company’s annual general meeting on 29 March. The chairman of the board of directors, Valentine Chitalu, told shareholders that the company was aiming for continued domestic success and to improve the strength of its business through the support of its shareholders. The company reported double-digit growth in production of clear beer, up 16 percent on the previous year, driven by improved demand across segments and strong growth of its affordable Eagle lager, explained outgoing finance director Faith Mukutu. The investment in production capacity has also had a knock-on effect along the company’s supply chain, growing the market for local agricultural products. “To get there, we will drive agricultural productivity, innovation and resilience to support our growers and their communities. Zambian Breweries has embarked on a deliberate and inclusive policy to create an out-grower cassava scheme covering over 4,000 small-scale farmers, who are predominantly women and youths, from Luapula Province and Kasama District,” said Mr Moran. Part of its investment was the commissioning of a US$1 million state-of-the-art plant Simultaneous Saccharification and Fermentation (SSF) plant in Ndola. The SSF operation has boosted the production of affordable Eagle Lager to over 200,000 hectolitres from the previous 50,000 hectolitres in 2014, using cassava and sorghum bought from local farmers. As a result of the growth of its affordable cassava-based Eagle lager, Zambian Breweries generated additional tax revenues to the national treasury of more than K20 million in the financial year ended December 31, 2017. “We are committed to enhancing economic growth for small-scale farmers, especially in rural areas by buying their crops and through our commitment to helping farmers, retailers, entrepreneurs and communities thrive,” Mr Moran said. In addition to the SSF plant, the brewer also installed a packaging plant at a total cost of US$30 million in Ndola, which has increased packaging capacity by one million hectolitres from 850,000 hectolitres. Lusaka’s packaging capacity currently stands at 800,000 hectolitres. Zambian Breweries also embarked on an ambitious refurbishing programme at its Ndola Plant over the last five years, spending US$100 million, to boost efficiency and productivity. In April 2017, President Edgar Chagwa Lungu commissioned the new state-of-the-art malting plant in the Lusaka South Multi Facility Economic Zone (LS-MFEZ) worth US$33 million. The plant has a maximum capacity of 15,000 tonnes of finished malt per year and will positively impact the local barley market. The plant has largely contributed to the total company’s brewing capacity of two million hectolitres. A further US$2 million has been invested in a new Castle Lite production line in Lusaka; and US$11 million in the production of carbonated soft drinks at the Ndola Plant; while the company spends between US$10 million and US$20 million annually on glass bottles. While this growth is commendable and impacts positively on the local community, the company has redoubled efforts in the area of responsible alcohol sale and consumption. Partnership with the Road Transport Safety Agency (RTSA), Liquors Association, selected youth organisations and schools are among some initiatives. Over the next three years, Zambian Breweries plans to spend just under US$1,000,000 to support activities tailored towards moderation and harm reduction in alcohol consumption.